Vague awareness, in other words. A most unpleasant state for any god. None of us is all knowing, all seeing, that is mortal nonsense — but we know a lot and see quite a bit. We are used to a near-constant infusion of information by means of senses no mortal possesses, but for a time there was nothing. Instead, I slept. Suddenly, though, in the depths of the silence and vagueness, I heard a voice. It called my name, my soul, with a fullness and strength that I had not heard in several mortal lifetimes. Familiar pulling sensation. Unpleasant. I was comfortable so I rolled over and tried to ignore it at first, but it pricked me awake, slapped me in the back to prod me forward, then shoved. I slid through an aperture in a wall of matter, like birth, or like entering the mortal realm, which was pretty much the same thing. I emerged naked and slippery with magic, my form reflexively solidifying itself for protection against the soul-devouring aethers which were once Nahadoth’s digestive fluids, in the time before time. My mind dragged itself out of stupor at last. Someone had called my name. “What do you want?” I said — or tried to say, though the words emerged from my lips as an unintelligible growl. Long before mortals had achieved a form worthy of imitation, I had taken the shape of a creature that loved mischief and cruelty in equal measure, as quintessential an encapsulation of my nature as my child-shape. I still tended to default to it, though I preferred the child-shape these days. More fine control and nuance. But I had not been not fully conscious when I took form in the mortal realm, and so I had become the cat. Yet that shape was clumsy when I tried to rise, and something about it… felt wrong. I wasted no time trying to understand it, simply shifted to the boy instead — or tried to. The change did not go as it should have. It took real effort, and my flesh remoulded itself with molasses-slow reluctance. By the time I had clothed myself in human skin I was exhausted. I flopped where I had materialized, panting and shaking and wondering what in the infinite hells was wrong with me. The voice that had summoned me from the vague place. Female. Familiar and yet not. Puzzled, I tried to lift my head and turn to face the voice’s owner, and found to my amazement that I could not. I had no strength. “It is you. My gods, I never imagined…” Soft hands touched my shoulders, pulled at me. I groaned softly as she rolled me onto my side. Something pulled at my head, painful. Why the hells was I cold? I was never cold. “By the endless Bright! This is — ” She touched my face. I turned toward her hand instinctively, nuzzling, and she gasped, jerking away. Then she stroked me again, and did not pull away when I pressed against her this time. She was Shahar. I was certain of it. But something had happened to her. Her face was longer, the bones finer, the nose-bridge higher. Her gold hair, which had been shoulder-length when I’d last seen her — a moment ago? the day before? — now tumbled around her body, disheveled as if she’d just woken from sleep. Waist-length at least, maybe longer. Mortal hair did not grow so quickly, and not even Arameri would waste magic on something so trivial. Not these days, anyhow. Yet when I tried to find the nearby stars to know how much time had passed, what came back to me was only a blank, unintelligble rumble, like the jabbering of memory-worms. “Cold,” I murmured. Shahar got up and went away. An instant later something covered me, warm and thick with the scents of her body and bird feathers. A duvet. It should not have warmed me, any more than my body should have been cold to begin with, but I felt better. By this point I could move a little, so I curled up under it gratefully. Screaming. She had been screaming. “Your hair,” said Shahar. I froze, staring up at her. She pushed at my arm, then pulled up a lock of hair for me to see. Loose-waved, dark brown, thick, and longer than her arm. Feet long. I couldn’t move because I was half tangled in it. “I didn’t tell my hair to get that long,” I said. It was a whisper. “Well, tell it to get short again. Or quit flopping about, so I can get you loose.” She flipped up the blanket and started gathering my hair, tugging and finger-combing. When she turned me onto my side, my head was freed. I’d been lying on the bulk of it. “Tried — I didn’t try to kill you.” Her face hardened further, full of hate. That meant I had tried to kill her, or at least she believed I had. “I didn’t mean to. Shahar — ” I reached for her again, instinctive this time. I could pull strength from mortal children if I had to… but when I touched her knee again, there was only a trickle of what I needed. Of course; eight years. She would be sixteen now — not yet a woman, but close. I whimpered in frustration and pulled away. Yes, good for me and for her. It was obvious she didn’t want me here. I didn’t want to be here, either, weak and heavy and wrong-feeling like this. I wanted to be with, with, wait, was that, oh no. “Who — ” she began. And then she froze, her eyes going wide, because even she could feel it now. Of course she could, because he was in the room with us, taking shape as the glowing walls went suddenly dark and the air trembled and hushed in reverence. “Sieh,” said the Lord of Night. I closed my eyes and prayed Shahar would stay silent. “Here,” I said. An instant later he was beside me, the drifting dark of his cloak settling around him as he knelt. Chilly fingers touched my face, and I fought the urge to laugh at my own obtuseness. I should have realized at once what it meant that I was so cold. And his dark, dark eyes lifted to settle on Shahar. She flinched, quite reasonably. Shahar made a soft sound, not quite a whimper, and Nahadoth’s expression turned sharp and hungry. I did not blame him for his anger, but Shahar was not like the Arameri of old; she had not been raised to know the ways of gods. She did not realize that her fear could spur him to attack, because night was the time of predators and she was acting too much like prey. Before I could think of some way to distract him, the worst occurred: she spoke. I stared at her. A curse? But her shift of mood had done what I could not; Naha exhaled and sat back. “A prayer would not have snatched me from your void,” I said, looking down at myself. The length of my limbs was obscene. My palms were half again as large as they had been! I was meant to have small, clever child-fingers, not these monstrous paws. “And it couldn’t have done this to me. Nothing should have done this.” Now that Naha had renewed my strength, I could correct the error. I willed myself back to normal. He sighed. “You do not understand.” So he looked into my eyes and made me know what he and Yeine had come to realize in the eight years since everything had gone wrong. There is a line between god and mortal that has nothing to do with immortality. It is material: a matter of substance, composition, flexibility. This was what ultimately made the demons weaker than us, though some of them had all our power: they could cross this line, become godstuff, but it took great effort, and they could not do it for long. It was not their natural state. Other mortals could not cross the line at all. They were locked to their flesh, aging as it aged, drawing strength from its strength and growing weak with its failure. They could not shape it or the world around them, save with the crude power of their hands and wits. The problem, Nahadoth willed me to know, was that I was no longer quite like a god. The substance of me was somewhere between godstuff and mortality — but becoming more mortal as time passed. I could still shape myself if I wished, as I had done when I arrived as the cat. But it would not go easily. There might be pain, damage to my flesh, permanent distortion. And there would come a day, perhaps today, perhaps another, when I would no longer be able to shape myself at all. If I tried then, I would die. I stared at him and felt truly afraid. I was breathing harder. I had not willed myself to breathe harder. Or tremble, or sweat, or grow larger, or mature into manhood. My body was doing all that on its own. My body: alien, tainted, out of control. Naha’s mask cracked, replaced by sorrow. I remembered ten million nights in his lap, begging him for stories. His beautiful lies, I had called them. He had held me and told me of wonders real and imagined, and I had been so happy to never grow up. So that he could keep lying to me forever. I could not bear the softness of his voice, no matter how hard the words. He was always so soft, always yielding, always tolerant of change. I did not want him to tolerate this. I threw off the blanket and got to my feet — awkwardly, as my limbs were longer than I was used to and I had too much hair — and stumbled over to Shahar’s windows. I put my hands on the glass and leaned on it with all my weight. Mortals rarely did this, I had observed during my centuries in Sky. Even though they knew that Sky’s glass was reinforced by magic and inhumanly precise engineering, they could not rid themselves of the fear that just once, the glass might break or the pane come loose. I braced my feet and shoved. I needed something in my presence to be unmoving and strong. Something touched my shoulder and I turned fast, irrationally aching for hard sunset eyes and harder brown arms and brick-wall flexibility. But it was only the mortal, Shahar. I glared at her, furious that she wasn’t who I wanted, and thought of batting her aside. It was her fault this had happened to me, somehow. Maybe killing her would free me. If she had looked at me with compassion or pity, I would have done it. There was none of that in her face, though — just resentment and reluctance, nothing at all comforting, because she was Arameri and that wasn’t something they did. Itempas had failed me, but Itempas’ chosen had been magnificently predictable for two thousand years. I yanked her closer and locked my arms around her, so tight that it couldn’t have been comfortable for her. She was shorter than me now and her cheek pressed against my collarbone. She did not bend, though — didn’t speak, didn’t return my embrace. So I held her and trembled and ground my teeth together so that I would not simply start screaming. I glared at Nahadoth through the screen of her curls. He gazed back at me, still and rueful. He knew full well why I had turned away from him, and he forgave me for it. I hated him for that, just as I’d hated Yeine for loving Itempas, and just as I hated Itempas for going mad and not being here when I needed him. And I hated all three of them for squandering each other’s love when I would give anything, anything, to have that for myself. There was an instant of silence. Then I felt him go. The walls resumed their glow; the room felt suddenly looser, airy. Shahar relaxed, minutely, against me. But not all the way. I kept her against me anyway because I was feeling selfish and I did not want to care what she wanted. But I was older now, more mature whether I wanted to be or not, so after a moment I stopped thinking solely about myself. She stepped back when I let her go, and there was a distinctly wary look in her eyes. I closed my eyes, understanding at last why she had cursed my name. I had stolen her innocence first, and then her brother. She would never trust me again. “I’m sorry,” I said, knowing it was wholly inadequate. She turned away then, pacing across her room to the door that adjoined her suite to the one that had been Dekarta’s. Opening it, she turned back to look at me, expectant. I stayed by the window, seeing the signs clearly now. Her face was impassive, cool, but she had not completely mastered herself yet. Fury smoldered in her, banked for now, but slow-burning. She was patient. Focused. I would have thought this a good thing, if I hadn’t seen it before. I expected her to dissemble. “My mother,” she said. Even with my senses as muddled as they were, I could feel the raw wound in her soul where a twin brother had been. A wound like that demanded redress. I took a step toward her and stopped, startled as I realized something. Arameri heads and heirs had loathed one another since the Bright’s dawning. Unavoidable, given circumstances: two souls with the strength to rule the world were rarely good at sharing, or even cohabitating for that matter. That was why the family’s heads had been as ruthless about controlling their heirs as they were about controlling the world. My eyes flicked to Shahar’s odd, incomplete blood-sigil. None of the controlling words were there. She was free to act against her mother, even plot to kill her, if she wanted. I crossed the room to stand beside her on the threshold. I was surprised to find myself uncertain as I considered her. I should have felt vindicated to hear her plans of matricide. I should have said, and meant it: You’ll do worse before you’re done. But I had tasted her childish soul, and there had been something in it that did not fit the vengeful murderess she seemed to have become. She had loved her brother, enough to sacrifice herself for him. She had sincerely yearned to be a good person. She lifted an eyebrow, and her eyes flicked down. I wore nothing but my ridiculously long hair, which fell to my ankles now that I was standing. (My nails, however, had kept to my preferred length. Partial mortality, partial growth? I would live in dread of my first manicure.) I thought Shahar was looking at my waist, but my body was longer now, taller. Belatedly I realized her gaze had settled lower. “You’re not a boy at all, anymore,” she said. My face went hot, though I did not know why. Bodies were just bodies, penises were just penises, yet she had somehow made me feel keenly uncomfortable with mine. I could think of nothing to say in reply. I shook my head. “Too much on my mind, even if I were exhausted. Which I’m not.” Yet. Belatedly I realized she was exhausted, her face lined and paler than usual. My time-sense was returning — murky, sluggish, but functional — so I understood it had been well past midnight when she’d summoned me. Cursed me. Had she been pacing the floor herself, her mind cluttered with troubles? What had caused her to remember me, however hatefully, after all this time? Did I want to know? She blinked, then smiled with one side of her mouth. Unlike her earlier smiles, this one was genuine, and free of bitterness. It made me see how lonely she was without her brother — and how young. Not so far removed, after all, from the child she had been. Then she stepped forward, putting her hands on my chest, and kissed me. It was light, friendly, just a warm press of her lips for an instant — but it rang through me like a crystal bell. She stepped back and I stared at her. I couldn’t help it. I nodded mutely, then went into Deka’s room. She shut the door behind me and I slumped back against it, feeling alone and very strange. 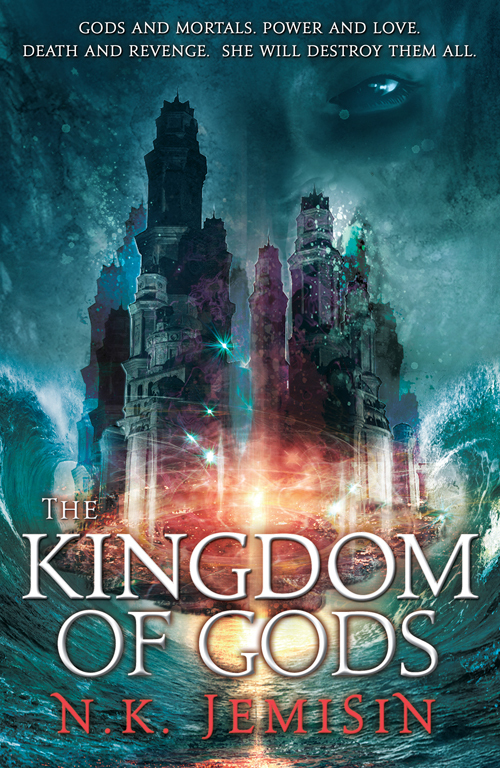 Preorder The Kingdom of Gods at Amazon, Powell’s, and Barnes & Noble!